1. 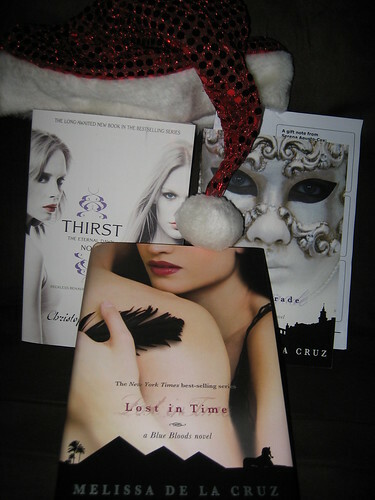 Lost in Timeby Melissa de la Cruz from SantaThing! 2. Masquerade by Melissa de la Cruz from SantaThing! 3. Thirst: The Eternal Dawn No. 3 by Christopher Pike from SantaThing! 4. Running the Rift by Naomi Benaron unsolicited from Algonquin Books. 5. Small Damages by Beth Kephart from the author for review. 6. 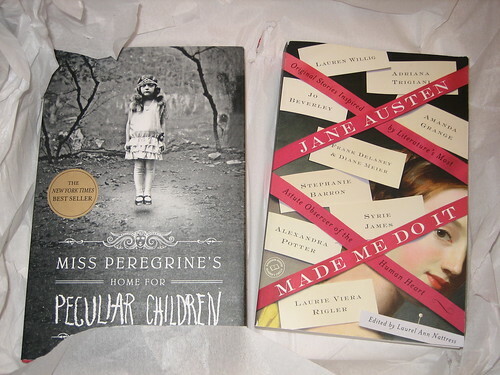 Miss Peregrine's Home for Peculiar Children by Ransom Riggs from Book Blogger Holiday Swap partner Sharon’s Garden of Book Reviews. 7. Jane Austen Made Me Do It edited by Laurel Ann Nattress from Book Blogger Holiday Swap partner Sharon’s Garden of Book Reviews. 8. All the Flowers in Shanghai by Duncan Jepson from Harper Collins for review. Santa Came Early, And Twice! The Holidays are nearly here, but the books are already rolling in! 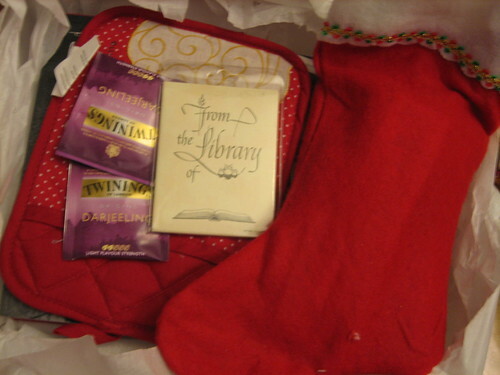 LibraryThing hosts SantaThing each year with its members and you can choose what level of participation between $10 and $30 and from what retailer whether Amazon or Book Depository. I love this program because you get to specify what kinds of books you’re looking for and most of the time they arrive on your doorstop by Christmas. My Book Blogger Holiday Swap gifts arrived as well, and I was excited to find a new blogger to follow as well — Sharon’s Garden of Book Reviews! 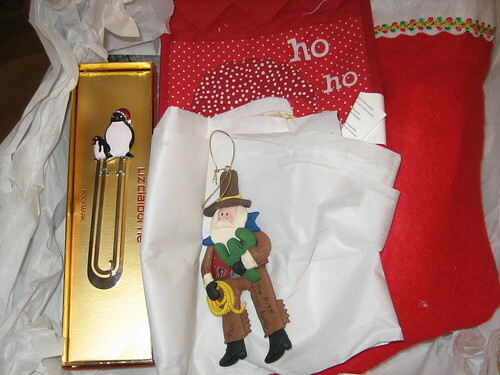 I got a boat load of cool goodies from a Santa ornament in a cowboy hat holding a cactus to a sparkly penguin bookmark and some bookplates. Who can’t use more bookplates when they lend out books? I know I can, though I probably would spend a mint to get all the bookplates I would need. 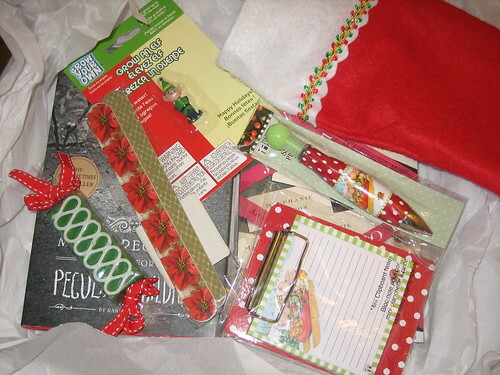 Here’s the goodies I got from Sharon! THANK YOU! Oh, yes, Wiggles and I with help from Daddy will watch the little Elf grow in water! Earlier this week I reviewed Jane Austen Made Me Do It edited by Laurel Ann Nattress of Austenprose fame. This collection provides readers with a wide breath of Jane Austen inspired short stories that range from love and romance to witty humor and mystery. Today, Laurel has graced us with her presence (and a giveaway) to talk about the more spooky stories in the collection in honor of Halloween, which is tomorrow. Get your candles burning and your costumes on; it’s time to trick or treat . . . or at least have a costume party with a little Jane Austen. Without further ado, here’s Laurel. Please give her a warm welcome and stay tuned for the giveaway. Hi Serena, I am so honored to be here today at Savvy Verse & Wit during my Grand Tour of the blogosphere in celebration of the release of my new Austen-inspired anthology, Jane Austen Made Me Do It. We don’t know if the Austen family celebrated All-Hallows Eve in Hampshire when Austen was a girl, but since they were very fond of family theatricals, I could imagine them reading out loud from the popular Gothic fiction novels of the day like, The Mysteries of Udolpho or The Monk, and scaring each other with horrid tales. Jane would later be so influenced by the Gothic genre that in 1798-99 she would write a parody of it. First entitled Susan, and later renamed as Northanger Abbey, the novel was published posthumously after her death in 1817. One of Austen’s lesser known works, I consider Northanger a hidden jewel, full of tongue-in cheek humor, allusions to Gothic fiction and more importantly, containing one of her most charming and endearing heroes, the teasingly witty Henry Tilney. Our heroine, Cate Cartwright, is part of the cast of “Ghost Trekkers”, currently filming at one of England’s most haunted homes, Northanger Abbey. Naturally, Cate knows there’s no such thing as ghosts. It’s all smoke and mirrors for the credulous who watch late night TV. At least, that’s what she thinks… until she meets the shade of one Miss Jane Austen during one fateful night at Northanger. In the wake of her most recent failed relationship, Cathy Fullerton takes an extended vacation in a converted Abbey in Gloucestershire, England. Ensconced in the Radcliffe Suite, a jet-lagged Cathy mistakes a walk-in closet for a Vaulted Chamber, a clothing rack for an Instrument of Torture and an accumulation of cobwebs for her True Love. Sara, obsessed with Pride and Prejudice, is jilted by Charles, who can’t compete with Mr. Darcy. His parting gift is a lock of Jane Austen’s hair. Sara wakes the next morning to find a strange woman sitting on the end of her bed. A figment of her imagination? No, it’s the astringent ghost of Jane Austen. On a mission to restore the reputation of forgotten Gothic author Clarissa Curstable, Jane Austen saves Sara’s career and brings Charles back before taking herself off into the ether, but there’s a price to pay, as the couple discover when they wake up to find another ghostly visitor at the end of the bed. It’s Jane’s friend, Clarissa – and she plans to stay. Mr. Darcy is every woman’s fantasy. But what happens when he becomes one woman’s reality? In 2007 Emily traveled from New York to England to go on a Jane Austen-inspired literary tour. There she met and fell in love with Spike, an English journalist. She also met Mr. Darcy… Or did she? She can never be sure if it really happened, or it was her over-active imagination. Now, four years later, she’s had a huge row with Spike and is back in London nursing a broken heart. And there’s only one person who can mend it. Mr. Darcy…. Well hidden from the ordinary world, in a little-known corner of jurisprudential hell known as the Court of Intolerable Stupidity, a legal drama of literary proportions unfolds. The plaintiff is none other than the most famous romantic hero of all time, Mr. Darcy. The defendants are the authors who dared write sequels, adaptations, and inspired-by’s of his Creator’s most beloved work, Pride and Prejudice. One of those works, whose author was tried and convicted in absentia, is so popular that its salacious swimming-in-the-lake scene has resulted in Darcy’s being forced to endure a perpetual state of shivering wetness in a transparent white shirt. For when Darcy’s adoring public isn’t throwing water on him, his umbrella breaks in the midst of a downpour. And now, between the zombies and the vampires, Darcy and his wife Elizabeth are at their wit’s end. So is defense attorney Fritz Williams, who not only fights a losing battle in a kangaroo court ruled by Darcy’s tyrannical aunt, the Honorable Lady Catherine de Bourgh, but also his secret infatuation with prosecuting attorney Tawny Wolfson. Who has her own secret: a hopeless addiction to the illegal miniseries that she is supposed to abhor. I hope that readers find Austen’s creative spirit and witty Gothic humor this Halloween by indulging in a bit of trick or treating with Jane Austen Made Me Do It. Please enjoy one of my favorite passages between Austen’s hero and heroine of Northanger Abbey to set the mood. Thanks so much, Laurel; it was great hosting you! 1. Leave a comment about your favorite Halloween story or what intrigues you about reading an Austen-inspired short story anthology. 2. Follow Laurel Ann Nattress on Facebook and Twitter, leaving a comment here that you did with your Facebook and Twitter names for 2 more entries. 3. Leave a comment on my review for another entry. 4. Blog, Tweet, Facebook the giveaway and leave a link here for up to 3 more entries. Deadline is Nov. 7, 2011, at 11:59PM EST. Winners to be drawn at random! Good luck to all!